Twelve skippers braved a raw and chilly day with westerly winds gusting up to 30mph to take part in the Met. 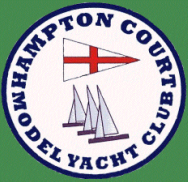 & Southern District RM Championship held at Hampton Court MYC on Sunday, 23rd March. It was clear from the start that conditions were going to be difficult and it became necessary for a number of skippers to make rig changes and minor repairs throughout the day. 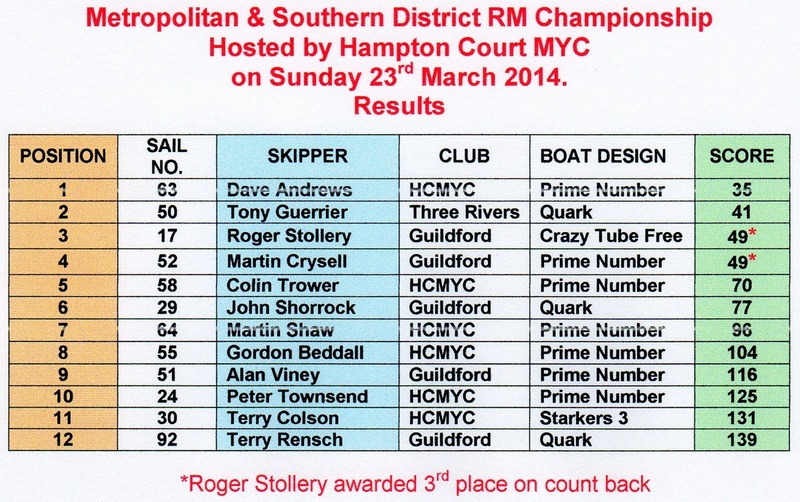 Overall, 18 races were sailed and it soon became clear that the main contenders were Dave Andrews (Hampton Court MYC), Tony Guerrier (Three Rivers RYC), and Roger Stollery and Martin Crysell both from Guildford MYC. At the halfway point it looked as though Tony Guerrier was edging ahead but a late rally by Dave Andrews winning four of the last seven races saw him emerge as the winner. My thanks go to the members of the race team, Duncan Blair, Hans Neeser, Graham Gurney, Mike Stroud and John Burch for their invaluable help in making the day a very successful one.